Sky has added two new children's channels to its internet TV service NOW TV, coinciding with the first week of the school summer holidays in many parts of England and Wales. Nickleodeon and Nick Jr are available on NOW TV's entertainment monthly pass, available for £4.99 a month, with no contract. Catch-up options are also available. The channels offer hit children's shows including Peppa Pig, Sanjay and Craig, SpongeBob and Dora The Explorer. The addition of Nickelodeon and Nick Jr to NOW TV brings the tally of children's channels on the service to three, joining the Disney Channel. 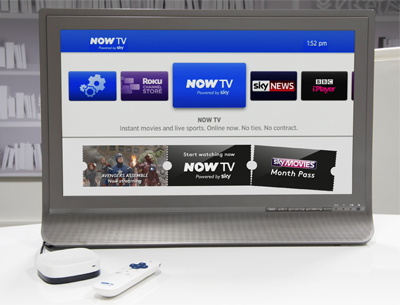 NOW TV is available on a variety of devices, including LG Freeview HD smart TVs, Roku, the NOW TV box and from this week, via the PS4. A broadband connection of at least 2.5 Mbps is required for the service to work.